A cheaper alternative to Google Glass? The Raspberry Pi has a number of features that make it well suited to a wearable computing application: It is cheap, which makes it a good candidate for experimentation by hobbyists and tinkerers; it's small, which makes it relatively easy to wear on the body; and, it has low power requirements, a must for mobile computing. A number of enthusiasts have taken up the challenge of creating a wearable computer with Raspberry Pi, here are a few examples. MakerBar, a US based collective of tinkerers and hardware enthusiasts, created a quick prototype of a wearable Raspberry Pi application in a matter of hours. The project uses a modified set of MyVu LCD glasses to create a monocular heads-up display. The full range of parts required cost an estimated $100. The project, despite being a quick, ad-hoc effort, showed how well suited the Raspberry Pi is for powering a wearable computing platform. It's a promising proof-of-concept that shows that at the very least the Raspberry Pi has some exciting potential as a platform for experimentation in this area. Unfortunately, this wearable Raspberry Pi project is no longer available, but it remains here as an example of how this technology can be used. A more in-depth instance of a wearable Raspberry Pi project can be found on this website, detailing the steps of putting together the system. This project uses some more complicated items, particularly the Vuzix video glasses, which alone cost $200. The estimated cost of the whole project is $400. Unlike the MakerBar project, this effort also includes a wireless adapter, making the wearable computer fully portable and connected. Check it out for pointers if you are looking to create a wearable Raspberry Pi solution for yourself. While these projects demonstrate that Raspberry Pi can power a wearable computing solution, they also highlight a number of drawbacks to using the Pi in this context. In any mobile computing application, power can be an issue, and for the Raspberry Pi it's particularly problematic. Even though the Pi is very power efficient as a computer, and can be powered off USB, most mobile projects power the Pi using 4 AA batteries, which is not the most elegant solution. This may not be insurmountable, as most mobile devices are powered by Lithium ion based batteries, and the community may certainly eventually produce an equivalent option for the Raspberry Pi. The other issue with using the Pi in a wearable project is in user input. Both of the projects above used a compact keyboard and trackpad combo, which can potentially be worn around the wrist. While adequate for a prototype, this is a fairly bulky and cumbersome option, particularly if the computer is to be worn for an extended period of time. Google Glass aims to overcome this challenge by implementing a touch sensitive, gesture-based input on the side of the glasses. Certainly, touch input devices for the Raspberry Pi exist, so it's only a matter of time before a more elegant touch interface for the Raspberry Pi is developed. An Alternative to Google Glass? It's unlikely that the Raspberry Pi will ever form the basis of a commercial product that will enter the world of wearable computing. Despite being well suited for the use, the Pi is still too bulky and underpowered to be a long-term solution; A better alternative might be a modified mobile device. However, at under $50, the Raspberry Pi is an incredible resource for experimentation in this field. 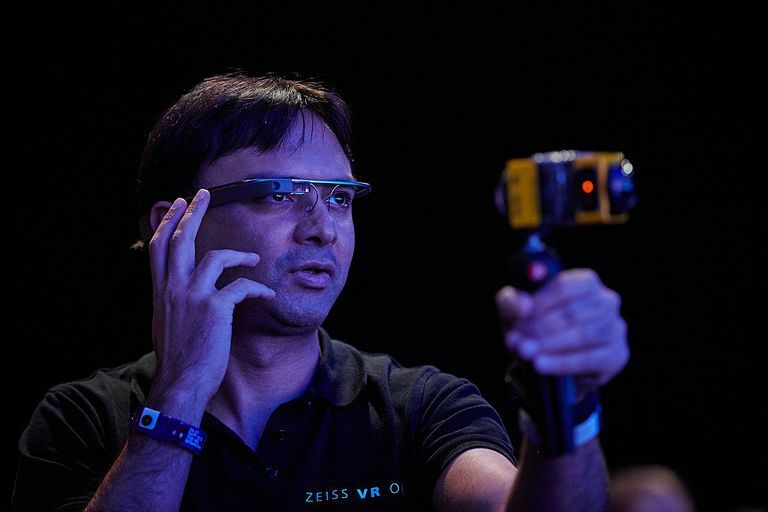 Currently, it's uncertain how wearable computers like Google Glass will be used by the general public. But, with cheap, accessible Raspberry Pi based projects to allow for tinkering and experimentation, the new models for human and computer interaction may well be discovered.